The title of today’s post may have caused you to raise an eyebrow. Shouldn’t students always love the pieces that they are playing? My answer to that – yes, they absolutely should. With the amazing wealth of piano music in our world, you can usually find a piece of music that your students find exciting and enjoyable to play. But sometimes love fades. And while you can certainly move on from music (as we wrote about here), if you think you can reignite a passion for an important piece, we have outlined some strategies below that might help. If your student is displaying a lack luster attitude toward his music, it’s time to act. Languishing on a piece makes for a toxic lesson environment for both you and your student. So, let’s take a look at 5 ways you can help your piano student connect with his music… in those times when he’s feeling no connection at all. If your student’s passion for a piece is fading, then perhaps a good dose of silly is in order. Change the piece title to something unexpected, descriptive and, maybe, even just plain weird. Add goofy rhyming lyrics or stickers to the top of the music page with speech bubble dialogue that causes a giggle. Change the ending of the piece to sound absurd or change the start to sound mysterious. Sometimes, small adjustments can often make a big difference. Bringing relevancy to a piece by providing a reason for it’s completion can be a powerful motivator for your piano student. Consider starting a recording project (see making student CDs here) or a musical youtube series with a set deadline and then prepping a motivating reason to have the piece ready (a CD launch party, sharing the video on social media etc.). Help your piano student come up with an action-packed storyline and then write comic descriptors above the phrases in his piano piece, like a movie storyboard (“He turns and sees a large, purple dragon…”). Decorate the page with stickers to match the story’s theme. Add interest to certain words with some color. Make it visually exciting and imaginative. Playing the piano can be a lonely pursuit, so adding a social aspect to your student’s piece can often be the factor that “turns it around” for him. Pair your student with another student who is learning, or who has learned the piece, and then split the piece into treble and bass parts, turning it into a duet. Have your students play the score study game we recently shared using their common piece. Your students can then become “Piano Piece Pen Pals” and trade recordings back and forth as they complete the piece. 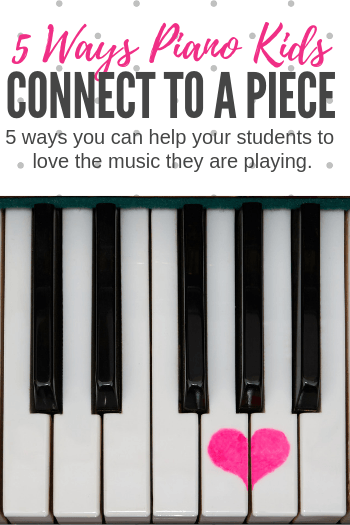 Providing recordings or playing the piece to your student can often help create a stronger connection. The aural feedback your student receives in the early stages of learning a piece is often not all that rewarding, but hearing his piece played “à la end product” can be enough motivation to see it through to completion. Follow these 5 steps whenever you play for your student. If At First You Don’t Succeed… Try Again With A New Piece! If you’ve tried our 5 tips and your student is still not engaged, then you’ll be thankful for a membership to Teach Piano Today’s PianoBookClub! Not only do we provide visually-stimulating piano books (a huge factor in motivation for young students) but we also help you build a varied library fast! With a brand new book arriving every month for just $8 you’ll have choices in music that can turn blah into bazinga! Find out more here.